ID: Often solitary, sometimes clumped in small communities. Bright orange with transparent tentacles. Sits in a hard, calcareous cup. Comments: I often note the small but colorful orange cup coral when diving the San Juan Islands and Cape Flattery area. Like most filter feeders, this species prefers solid structure for a good footing and ample current to deliver nutrients. 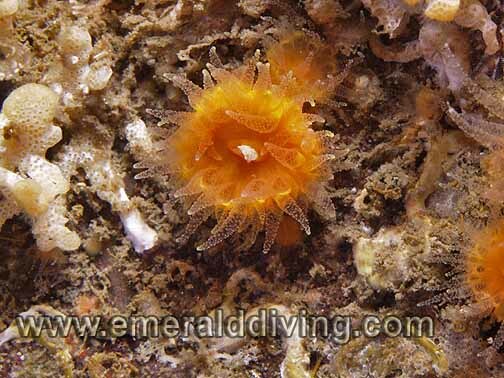 ID: Similar to sea strawberries - orange coloration, branching trunk supporting thousands of polyps. Comments: I only note this species in the southern Gulf Islands and on a seamount between Sucia and Patos Islands in the San Juan Island, although some of my dive buddies claim to have seen this soft coral at Neah Bay. Unlike the sea strawberry, it tends to grow in scattered colonies. 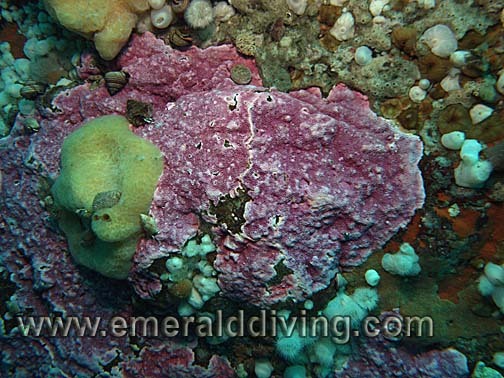 ID: Pink to red branches with white polyps. 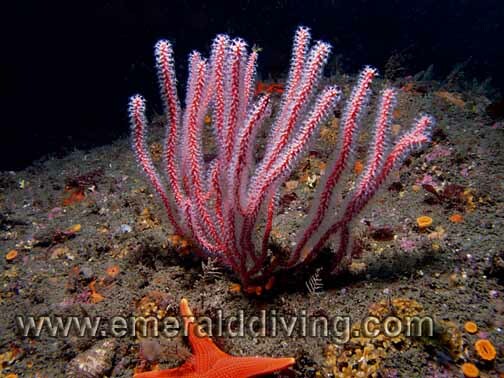 Comments: I only note the gorgeous red gorgonian coral at depths of 60 feet or more when diving the Cape Flattery area. I usually find this coral in isolation from other red gorgonians. I can vouch that robust specimens of this species are thriving at Mushroom Rock and Slant Rock. 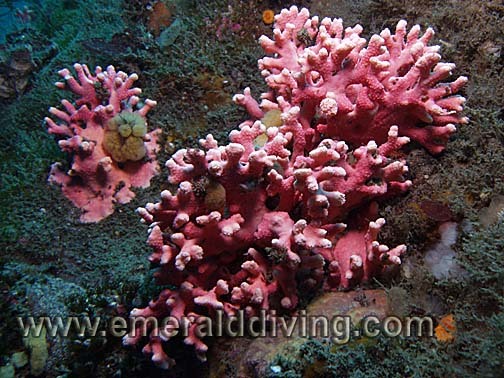 ID: Pink to red to white clusters of small, rounded lobes with retractable polyps. Comments: I only note the sea strawberry when diving the Cape Flattery area. These soft corals are much more prevalent in sections of Canada, specifically the Browning Pass area. The orange peel nudibranch is a known predator of sea strawberries. 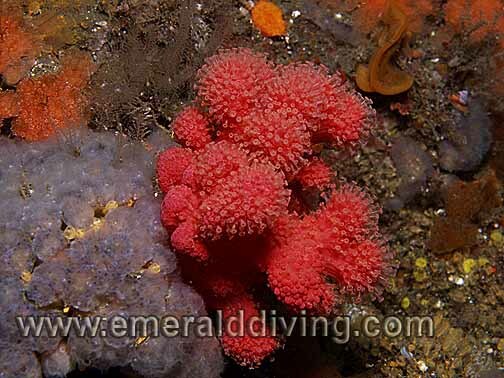 The sea strawberry can retract its flowery red polyps and look like a red lumpy mass. 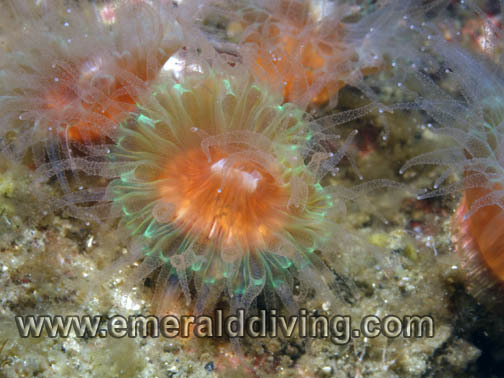 Comments: With a name like "strawberry anemone" you would guess that this colorful invertebrate is an anemone...but no! 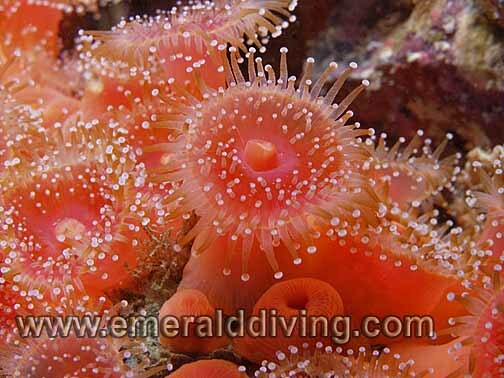 Classified as a soft coral, the strawberry anemone grows in dense colonies on current swept reefs. I have only noted this species at Long Island Wall in the San Juan Islands and around Tatoosh Island in the Cape Flattery area. ID: Long, slender white stalk. Much shorter than sea whips. Comments: The frail looking white seapen is nowhere near as robust or common as the orange seapen. I only occasionally note this species on soft substrates, and they are usually on the small side (4-6"). Pictured is one of the larger white seapens I have encountered. I found this specimen by the deep barge at the Shilshole Wrecks. ID: Long slender column. Yellowish-brown color. Grows in dense colonies. Comments: Like the strawberry anemone, zoantihids look like anemones, but are colonial animals. 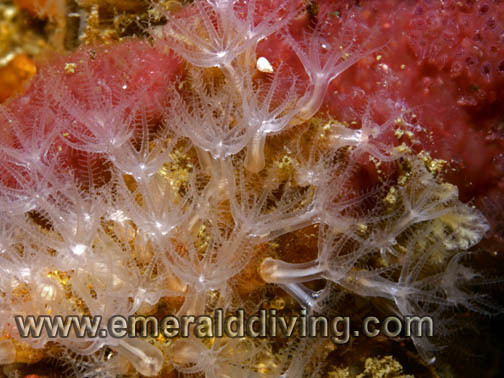 These soft corals are very common throughout Northwest waters and often carpet the underside of ledges with dense agreegations. The Possession Point is a great place to observe zoanthids. ID: Distinctive pink color. Short antler-like branches. Hard exterior. 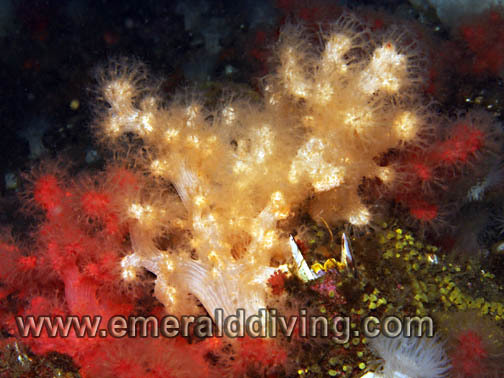 Comments: Pink branching hydrocoral can add amazing color some dives. 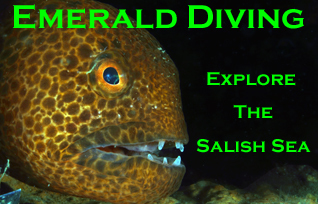 I typically note this species only in high current areas around Cape Flattery and parts of the San Juan Islands. At least one of the seamounts between Sucia and Patos boasts and amazing field of this hydocoral. ID: Hard purple encrustation with small pores and lighter margin. 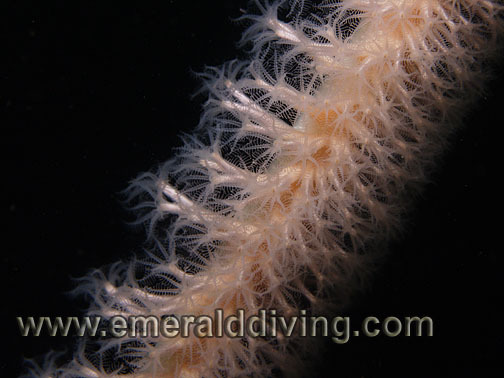 Comments: This is a fairly common hydroid found in the current intensive waters along the Washington coast. There are various species of this hydrocoral the look identical and can only be distinguished in a lab. ID: Long, white stalk with rows of white polyps. One end buried in the silt. Comments: The graceful seawhip is not a common encounter. It tends to prefer soft substrates subjected to mild current. 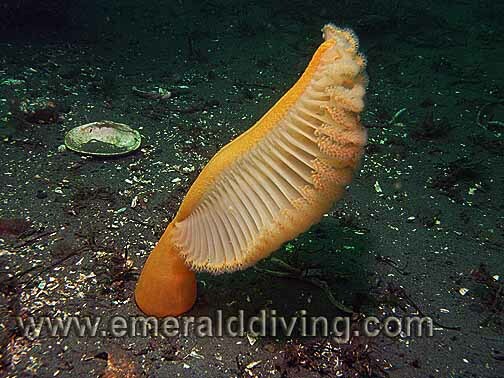 I only note this beautiful colonial animal when diving Hood Canal. Photo take at Flagpole Point. 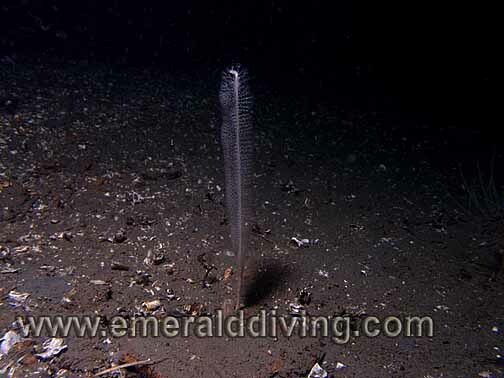 There is a small field of seawhips south of the wall at Flagpole Point in about 80 feet of water. 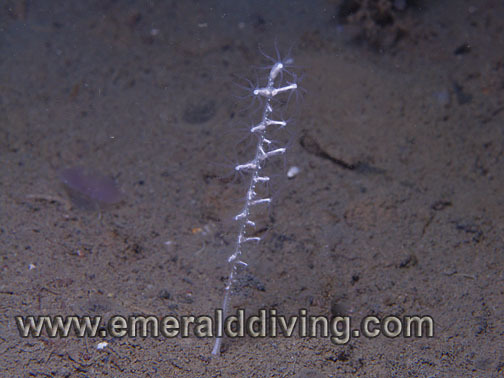 Comments: A close-up of a seawhip stalk that shows the the colonial polyps in detail. ID: White, stick-lie appearance with low density of polyps. Comments: Juvenile seawhips are often easier to find then their mature relatives. 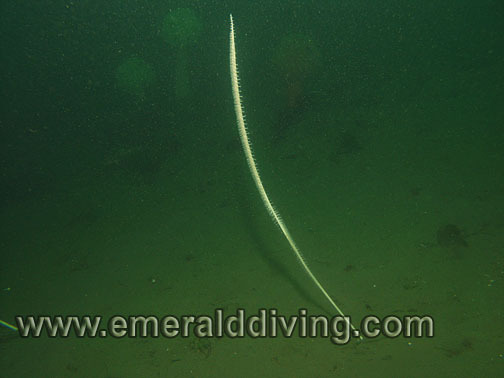 Fields of juvenile seawhips are readily found on the north side of the wall at flagpole Point in Hood Canal. Note the individual polyps. If not eaten by nudibranchs or other invertebrates, there will be an extensive field of seawhip on the north side of Flagpole Point in a few years. ID: Distinctive shape and bright orange color. Thick stalk anchored in sediment. Polyps on branches. Can retract into the sediment. Comments: Like all corals, the beautiful orange seapen is a colonial animal. I commonly note orange seapens throughout Washington waters on soft substrates, often in dense fields. This seapen can retract itself completely into the sand. The orange seapen is veraciously hunted by stricked and pink nudibranchs. Comments: That's right - sea strawberries now come in white! Actually kind of a very pale pink, but it looks white next to the red variety. Photographed at Pearse Island in the Johnstone Strait, British Columbia. ID: Thick orange branches with obvious star-like pores. Comments: Showing the diversity within this family, this hydrocoral is also consider a pink hydrocoral, even though it is orange. 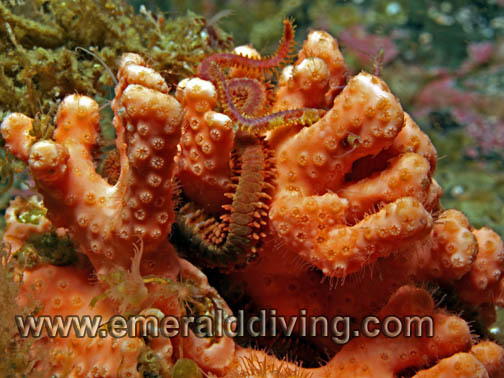 Note brittle star arms intertwined throughout the hydrocorals structure. Like other hydrocorals, this one is hard to the touch. ID: Translucent tentacles (sometimes with green iridescense) surrounding a oval shaped disk . 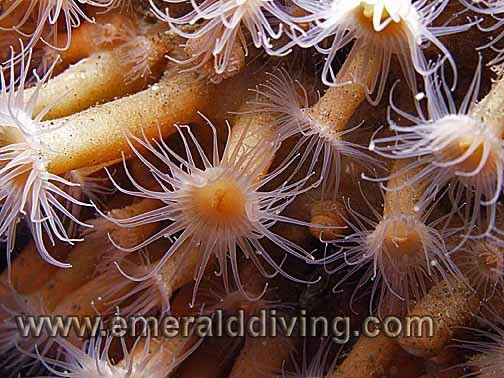 ID: Pale white colonial polyps. 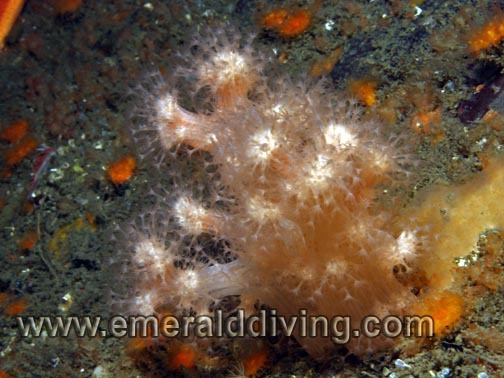 Comments: I have only noted this delicate and unobtrusive soft coral when diving Browning Pass in British Columbia. It is often obsecured by bigger and more obvious invertebrates. Photgraphed amongst the mulitude of invertbrates on the outside of Seven Tree Island in Browning Pass.